An Industry Standard for User-Centered Design. It’s the Basis for Waxcreative’s Web-Dev Process: 1-2-3-4-5... Lather, Rinse, Repeat. 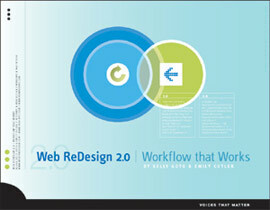 Web ReDesign: Workflow that Works, co-authored by Waxcreative founder Emily Cotler and Kelly Goto, one of the most-prominent women in the web design industry, is one of those books that changed the way websites are approached. Web ReDesign exploded on the scene a long time ago, and has remained a constant ever since. In an industry where the lifespan of a book is pixie-cut short, this is saying something. Since the release of the first edition (pictured below with its many offspring) in August 2001, Web ReDesign: Workflow that Works has assisted designers, site producers, in-house webmasters, and a company owners trying to move their web presence to the next level. It has become staples in both the industry and in education. When released it ranked as high as #8 on Amazon. It went into three reprints before it was picked up for a second edition (pictured at right) December 2004. It is still in print. The workflow is timeless, and easily applicable regardless of framework. Lauded for its easy-to-read overview of web processes, the Five-Phased Plan Kelly and Emily presented way back when still applies. It has been translated into 14 languages (at last count), including Spanish, Japanese, Russian, French, and Finnish. Want a copy? Why, thanks. Get it from Amazon.com. Web Redesign’s companion site, Web-Redesign.com, is the book’s accompaniment. It was built before WordPress was a BuzzWord, and, in epic Cobbler’s Kids fashion, was never actually converted into CSS after the original table-based site was built in August 2001 and no, it’s not mobile (sorry!). But it still houses many of the downloadable tools presented in the book. It is still accessed almost every day, and Kelly and Emily continue to receive emails from readers who find the book helpful. Not bad for a book written before Twitter meant anything other than the sound of birds. A Third Edition? Kelly and Emily regularly toy with the idea. Why not? The Queen became a Bond Girl, so really, anything is possible.